Chris Ryniak and Amanda Louise Spayd. “Unseen Forces” finds the two artists bringing us a glimpse of their trademark characters in a world steeped in magic and sorcery and….cake. Follow Shing Yin Khor, Carisa Swenson , Melita Curphy, Valency Genis, Yosiell Lorenzo and Shea Brittain as they take us for a trip down the rabbit hole to experience a world inhabited by creatures that lurk in caves and crevices which fall just beyond the sun’s reach. The Circus Posterus Caravan made its way to Pasadena for DesignerCon 2012, aka whirlwind of the century! This event saw the largest turnout at the CP booth in the collective’s HISTORY! A little over a year since her Sweet & Sorrow solo exhibition at Stranger Factory, Kathie returns with HAUNTED, a riveting collection of new two- and three-dimensional works that marks her most prolific and ambitious exhibition to date. The Sandia Peak Tram in Albuquerque is the longest in the world. Climbing a staggering 10,000 feet over 2.7 miles, you experience 4 elevation changes — the equivalent of driving from NM all the way up to Alberta, Canada! Stranger Factory hosted a set of stellar exhibitions in September with incredible new works from Doubleparlour, Travis Lampe, Jon MacNair and Joel Nakamura! CP’s own Travis Louie blows into town for his first-ever solo exhibition at Stranger Factory, and he brought along a few friends! Comic art legend Phil Noto brings the glam of the golden era to Stranger Factory with ‘A Certain Splendor’. Have a romp into the realm of the strange and unsettling with a triple-header solo extravaganza from Chet Zar, Charlie Immer and Stephan Webb! Spectrum Fantastic Art celebrated its first-ever convention in lovely Kansas City, MO! Hundreds of artists from all over the globe flew in to experience what was one of the most incredible gatherings of artistic talent in one room. 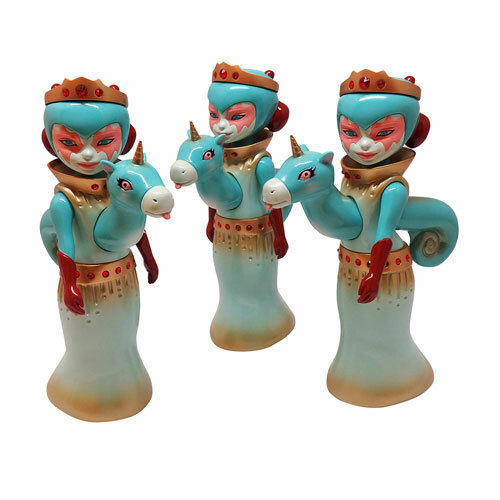 Ragnar and Scott Tolleson team up for a two person retro-bition at Stranger Factory! Late Season was a two-person exhibition by Circus Posterus artists Chris Ryniak and Amanda Louise Spayd. It opened at Stranger Factory in Albuquerque, NM, on Nov. 18th, 2011. Circus Posterus returns to Atlanta for the city’s favorite nerdothon, Dragon*Con! Kathie Olivas, Brandt Peters, Amanda Louise Spayd, Chris Ryniak, Glenn Barr and Steve Brown were all there for the madness, which took place over Labor Day weekend. Circus Posterus celebrated the opening of its own gallery, Stranger Factory, with an inaugural group show featuring new works from Kathie Olivas, Travis Louie, FERG, Brandt Peters, Jason Limon, Kelly Denato, Andrew Bell, CMR, Amanda Louise Spayd and many more! See our artistic process, sketches, work-in-progress photos and other unfinished pieces of art. A huge gathering of pop-sci-fi, fantasy and gaming — nerds of the best kind — reveal themselves every year in Atlanta. The Circus was there for the action. Phantasmagoria was a gallery show held at Yves Laroche Galerie d’art in Montreal on Oct. 27th, 2010. The show featured new works from Travis Louie, Kathie Olivas, Chet Zar and Brandt Peters.